Ipoh, my beloved hometown, is usually known for its heritage and delicious Ipoh food. And maybe pretty girls – that’s just about it. 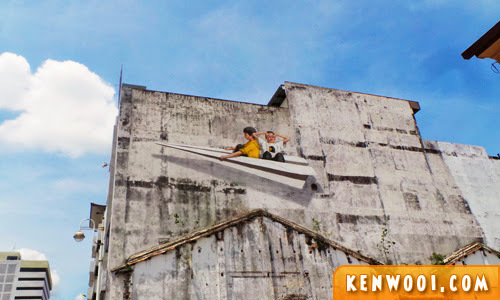 But now, there’s a new attraction in town, called the “Art of Oldtown“, which is the latest collection of Ipoh Wall Art Murals by Ernest Zacharevic, the same man who painted murals on walls along the streets of Penang’s Georgetown. There are currently 7 spots around Ipoh Old Town. Therefore, during my recent trip back, I’ve decided to scout for the locations of the murals. 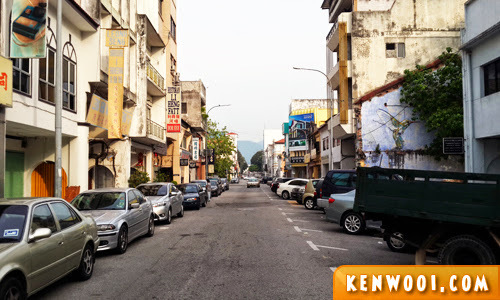 So here are the 7 Ipoh wall art murals locations with the exact road names and GPS coordinates. The mural shows a portrait of an old uncle drinking coffee. It’s located nearby the famous franchise OldTown White Coffee eatery facing the Ipoh Field. 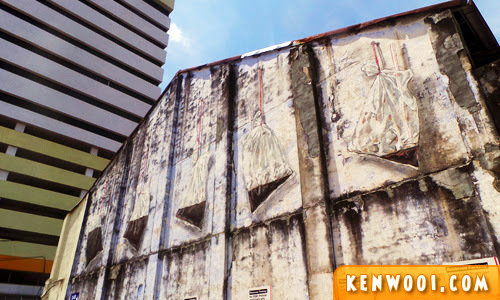 Nearby the first mural, just walk further down the road from Oldtown White Coffee and the Paper Plane mural can be seen. It shows 2 children enjoying their childhood with a paper plane. This mural can be reached if you continued to walk along the road adjacent to Ipoh Field and across the main road. 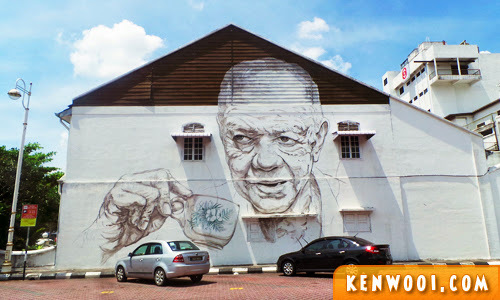 Kopi “O”, despite being black coffee, is one of the murals to celebrate Ipoh as the birth of the famous white coffee. The mural depicts a hummingbird hovering close by a tree in search of food. 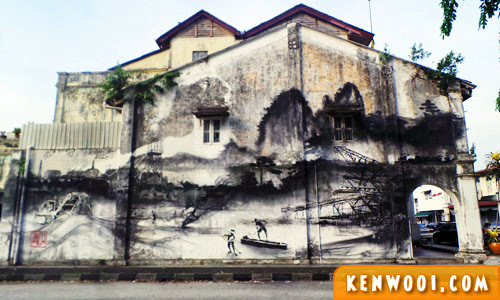 This Chinese-style painted mural shows Ipoh’s evolution from a tin-mining town back in the colonial days. The mural illustrates a girl tiptoeing on a classic red plastic chair while reaching toward a cage of birds. 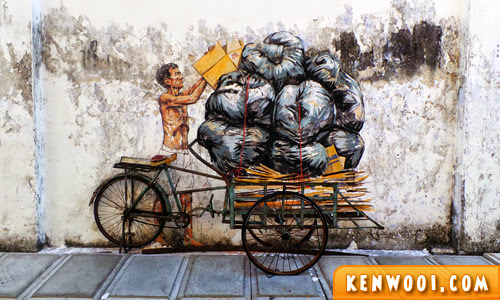 The final mural shows a man making a living in the town of Ipoh by stacking black plastic bags containing rubbish or recyclable items onto a trishaw. So yeah, these are the 7 wall art murals drawn by Ernest Zacharevic in Ipoh. 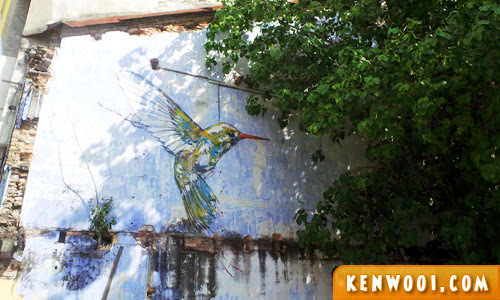 The murals do relive a sense of nostalgic moments related to Ipoh’s heritage and culture. Here’s a map with the exact location of the murals. 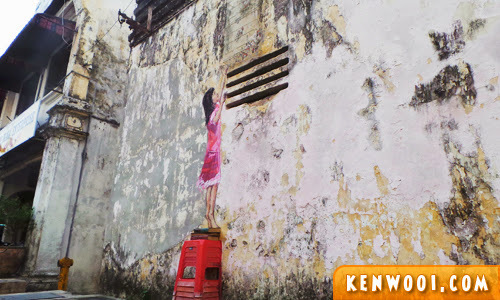 You can also get the Ipoh Wall Art Mural by Ernest Zacharevic by kenwooi.com on Google Maps. Thank you for listing out the exact locations for the murals. Easier to find now. The kopi bing attract me the most! yea saw in some blogs of the new murals. OLD UNCLE WITH COFFEE CUP, fantastic !! Great piece of art! I love it! I really like these lovely murals! Since I will be staying in Penang for several days, is it practical to have a day trip to Ipoh? By bus or train? Please kindly advise! Thanks so much for sharing! Will do a trail walk soon! Seen the mural on my last visit and take my breath away! Great art work and remind me of the good old days! Still miss Ipoh my hometown even though left over 35+ years! Still a great city to visit with lots of memories! 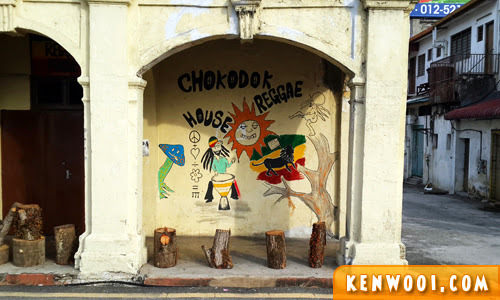 Great post and very nice photos, especially with the name, description and location for each of the Ipoh Street Art piece. The information is very useful for my trip to explore this very unique and lovely town. Thank you!